Councillors and staff at Alnwick Town Council were saddened to hear of the death last week of Councillor Charles Westendarp. Charles died in Cramlington Hospital after a short illness. Councillor Westendarp joined the Town Council in May 2017 and was a great supporter of Alnwick. He was heavily involved with a wide range of organisations and will be sadly missed by all. 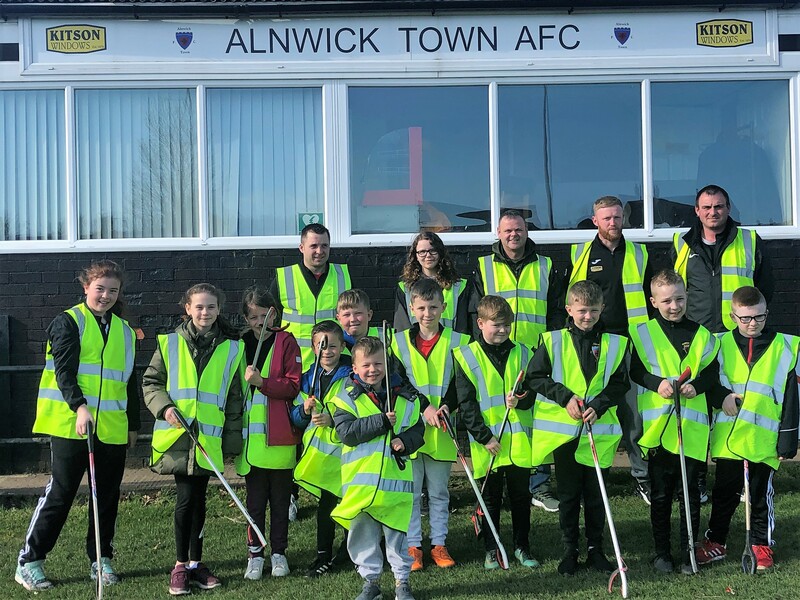 Sunday 24th March was the tidy up day in Alnwick with over 80 people turning out to take part in this annual community event. Representatives came from a wide range of organisations including Alnwick in Bloom, Alnwick Chamber of Trade, Alnwick Civic Society, Alnwick Area Friends of the Earth, Alnwick Cubs & Scouts, Alnwick Garden, Alnwick Town Junior Football Club, Alnwick Choral Society, Alnwick Dolphins, HospiceCare, Loving Alnwick, RAF Boulmer as well as Town Councillors, Officers and members of the public. 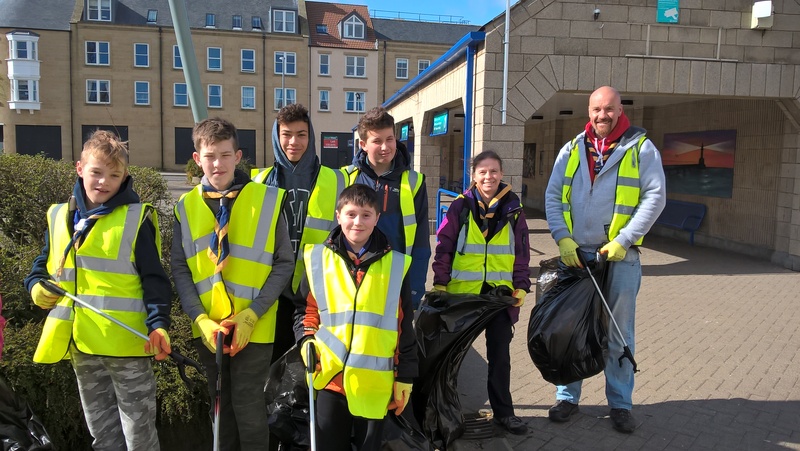 The main focus was on key areas in and around the town centre including Alnwick Bus Station, Greenwell Lane / Greenwell Road car parks, Sainsbury’s and Homebase car parks, Swansfield Park, Roxburgh Place Car Park, Taylor Drive, Willowburn Avenue, Upper Dodds Lane and Correction Lane, Stonewell Lane, Market Place and involved litter picking, sweeping, weeding and general tidying. Mayor Alan Symmonds said “to see so many people taking pride in their town was fantastic to see. All their hard work certainly helps to get the town ready for the visitors who will come to Alnwick this year. It’s clear to see that the town has certainly benefitted from its Spring clean. 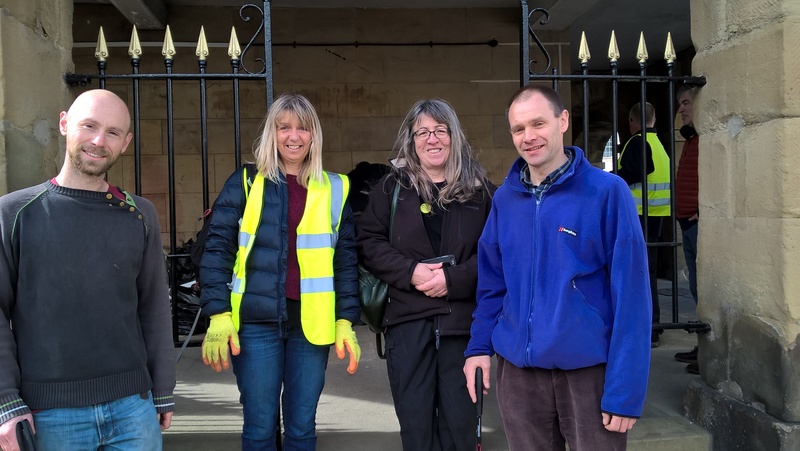 The Town Council would like to say a big thank you all those who took part in the tidy up which is a great way to get the town ready for Easter and the season ahead”. Following the clean-up homemade refreshments were served at the Alnwick Youth Hostel. Alnwick Town Council has announced two staff vacancies. One is for a Chief Officer & Town Clerk and the other is for a part time Town Handyperson. The Chief Officer & Town Clerk vacancy has arisen due to the retirement of current Chief Officer & Town Clerk, Bill Batey who is retiring at the end of September 2019 having been in post since 2010. The Town Handyperson is a new part time post. Anyone interested in being considered for either vacancy is requested to download the relevant documents below. Completed applications should be submitted to Bill Batey, Chief Officer and Town Clerk, Council Offices, Greenwell Lane, Alnwick, NE66 1HB or emailed to alnwicktownclerk@btconnect.com not later than noon on Wednesday 24th April 2019. Anyone wishing to find out more about either vacancy is asked to contact Bill Batey on 07971 810267 or on the email above. Charlotte Wilson, Finance Director from North East Equality & Diversity Ltd (NEED) updated the Council on their activities. She reminded councillors that the charity had started in 2002 becoming NEED in 2010 with the aim of offering accessible cost effective transport. At present they had 27 minibuses around Northumberland including Alnwick which operated a number of contracts including a home to school contract for Northumberland County Council, a dialysis and patient transport for North East Ambulance Service (NEAS) and secure transport for the NHS. They also operate 3 dial a ride schemes, two in Alnwick and one in Morpeth. In addition, they offer a ‘need a car scheme’ where pool cars are used to take people to medical appointments and social events. The scheme had proved very popular with 650 people using it in 2018 and 72 in January 2019. Charlotte reported that NEED are buying the old fire station on South Road with some of the building being used by NEED and some accommodating some 8 small business start-up units. There will also be a meeting room on site with white board and wi-fi which people can make use of. Charlotte then told councillors about the training that NEED offer. They offer Minibus Drivers (MiDAS) courses; Emergency First Aid; Drivers Certificate in Professional Competence (CPC); Managing Violence and Aggression and Basic Risk Assessment. In addition NEED are working in a consortium with CP Training from Carlisle to offer the additional training in Alnwick that all minibus drivers now need. Tim Kirton the Project & Funding Officer gave feedback on the Bill Grimsey’s recent presentation to the Business Forum. He outlined that the event was well received and attended, with over 70 people present. Mr Kirton summarised the presentation and highlighted that amongst many likely changes ahead, Mr Grimsey warned that the smart-phone will, over the next few years, replace the car in shaping town centres and that all stakeholders need to collaborate to diversify their town centres away from traditional retail. Mr Grimsey also suggested town centres needed to become community hubs offering a unique experience to visitors and residents alike. The Town Council agreed will finalise its response to Mr Grimsey’s presentation over the next few weeks. The Town Council agreed, subject to further consultation with individual businesses, to support the County Council proposals for a trial pedestrianisation scheme in Narrowgate. The trial could be in place for the summer and follows public consultation in November when the overwhelming choice of residents was for a pedestrianisation scheme. Town Clerk Bill Batey updated councillors on the recent public meeting about the Lindisfarne Sports Centre which was organized by the Alnwick Forum, and on the current information available on the building. The Council agreed to organise and chair a working group of users to look at future use, including possible new activities. The Council approved the draft accounts for the Mechanics Institute for 2018/19. The Accounts showed a surplus of just over £6,000 for the year. It was agreed that this surplus will be reinvested back into the building over the next 12 months, with planned works including kitchen improvements and external repairs. Councillors approved a budget and Town Council precept of £306,585 for 2019/20. For a Band D dwelling this will equates to an annual increase of £4.62 (8.9p per week) and will be a 4.4% increase. The new Alnwick Band D town council precept is likely to be £109.91 per annum. The 2019/20 budget will include an increased budget to assist town events (increased by £4,145) and an additional £5,000 for grants to local organisations. £3,500 is also budgeted for the painting of Town Centre lighting columns and funding is provided for an additional part-time operative. The Town Council’s Projects and Funding Officer, Tim Kirton, informed Councillors that there would be a special meeting of the Business Forum on the afternoon of Wednesday 13th February which would be attended by the nationally renowned retail analyst Bill Grimsey, author of The Grimsey Reports of 2013 and 2018. Mr. Grimsey would tour the town and then present to the Forum on his vision for what town centres and High Streets must do to increase their viability and ensure their survival in the future. Sergeant Sharon Wilmore-Greaves from Northumbria Police gave the Town Council an update on police matters. She reported that there had been a slight increase in the number of overall offences across Northumbria from 2017/18 to 2018/19 but that in the Alnwick area overall crimes had dropped by 2%. Sergeant Wilmore-Greaves confirmed that in Alnwick the number of burglaries and drunk and disorderly offences had increased before Christmas but anti-social behaviour offences were down. She advised that several police operations had been put in place in the run up to Christmas, one of which was a focus on theft from small businesses and shops. When asked about the town CCTV system, which has installed by the Town Council, Sergeant Wilmore-Greaves commented “the CCTV system has been helpful providing evidence in a number of convictions including assaults”. She went on the say “the local police worked with the Town Council to ensure that the cameras were placed at the most useful locations around the town. We have been working together to adjust the locations and angles of the cameras since they were installed, to ensure that they give the best coverage”. The Town Council will shortly be adding two number plate recognition cameras to the town system, this will further help the police in their investigations. Sergeant Wilmore-Greaves reported that, in the run up to Christmas, there had also been an evening operation run in conjunction with Trading Standards which had targeted underage drinking. She informed councillors that underage drinking had only been found in one out of the ten locations visited. Councillors received an update report on the Alnwick Bike Track and also heard from Ian McCrae from Gallery Youth about their outreach work at the facility. Councillors agreed to place £10,000 into a fund for future repairs and maintenance and then committed the Council to undertake the necessary works for the next 3 years, and then reviewing the situation. It was a requirement of the grant funding received from Sport England that a fund be established for future repairs and maintenance. The Council were granted a 20 year lease for the site by Northumberland Estates, in 2016. Councillors held a minutes silence and paid their respects to former Town Councillor Ritchie Waddell who died recently. Ritchie was a former town Mayor who retired as a councillor in 2013 and had served Alnwick Councils for 51 years. Town Mayor, Alan Symmonds thanked everyone who attended the Civic Carol service on 12th December at St Michaels Church and in particular he highlighted the contributions by the Bailiffgate Singers, St Paul’s School Choir and the readers from North Northumberland Hospice Care. Councillor Symmonds was delighted that the collection had raised £423.42 for Hospice Care. Councillors received a report from the Tim Kirton, Projects and Funding Officer and heard that there has been a net slight rise in town centre business premises vacancies – but that further occupancies might nullify this early in the new year. Since the first survey of vacant town centre business properties undertaken in July, 9 premises had been vacated but 6 of those 9 had been quickly re-let whilst another building vacated two years ago is currently being converted for re-use. The net reduction in occupancy is 2 business units. However, property landlords have advised that a further two or even three units are expected to be occupied early in 2019. Mr Kirton reported: “The turnover of town centre premises appears to be quite fluid and landlords have reported much interest in vacant units so there is a good degree of buoyancy there. The Town Council is working closely with agents to help them find occupants of vacant units as quickly as possible. A motion on the Council’s response to Climate Change was debated and it was resolved that ‘Alnwick Town Council aims to become carbon neutral by 2031′. All the Councillors who spoke in the debate acknowledged the seriousness of the current situation and that Alnwick Town Council should play its part in decarbonising both its own activities and take a leadership role within the town to encourage and enable our community to seek ways to do likewise. The detail of how this process is to be conducted is to be worked out by Councillors in the coming months. For the Council this will most likely involve a carbon audit and the setting of interim targets for emissions for the coming years. Town Councillors were unanimous in their objection to proposed new charges by the County Council for the management of events. Councillor George Mavin commented “Northumberland has just won the title of Best UK Holiday County of the Year for the first time and the County Council’s proposed new charges would mean that they are not supporting local events which is the reason many visitors come to Northumberland”. Alnwick Town Council’s next Business Forum will take place on Wednesday 13th February at 2.30pm and will be a presentation by the nationally renowned retail analyst Bill Grimsey, author of The Grimsey Reports (2013 and 2018). Mr Grimsey will tour the town then present his vision for what town centres and High Streets must do to increase their viability and ensure their future survival. Mr Grimsey started his career as a trainee retail manager and worked for Tesco and Wickes and was CEO of Iceland.